You might have heard of Legionnaires disease, Legionellosis or Legionella but are not sure of the risks related to your buildings water systems. A person infected by this disease can develop a serious pneumonia which, in some cases, can be lethal. According to the CDC, in the US there are 5,000 cases of Legionnaires outbreaks reported yearly in which 1 out of 10 people will die. In 9 out of 10 cases, these outbreaks were preventable. In an attempt to assist building owners with cooling tower, we wish to share with you 5 elements to consider to assist in mitigating Legionnaires disease in your building water systems. Where does this Legionnaire disease come from? There are over 25 related species of Legionella bacterium present in nature. These bacterium are naturally present in streams, rivers, lakes and are relatively harmless. The serogroup responsible for Legionella disease and which is the most lethal is Legionella pneumophila. It becomes a serious health concern when present in man-made water systems. Why is it a serious health issue in man-made water systems and not in nature? Once this bacterium species becomes airborne by misting of water fountains, evaporation of water in cooling towers or in spas/pools, it has the ability to travel with air currents and infect people relatively near the source of contamination. Once infected, a serious pneumonia can be developed. All building owners with cooling towers or evaporative condensers for their HVAC&R systems, spas/whirlpools, ornamental fountains, misters and humidifiers are at risk. What can I do to mitigate my risks? Assessment and analysis of your building water systems: Does your building have any of the items listed as a risk factor (cooling towers, fountains, misters, etc.)? How the water is received and processed. Process flow diagram – identify potential risks in the systems water flow. Put in place a water treatment program developed by water treatment professional: Recurring water disinfection is a requirement. There are high performing, sustainable water disinfection technologies in the market to avoid expensive & recurring chemical cost. EMO3 can assist you with our Insitu-O3 product. Ensure no stagnation of water – Legionella thrives in warm waters between 72F to 104F (22C to 40C) and develops in biofilms. Ensure there are no dead-arms in your water systems and provide adequate water recirculation. Ensure the plan includes a maintenance and contingency plan in case of outbreak. Communication & control: Share the plan with your team and ensure clear responsibility of tasks. Limit the spread of mist from your water systems. There are numerous solutions on the market that can assist in reducing the mist spray from travelling from your water systems. Establish a sampling schedule: There are several user-friendly tools to monitor the bacteria counts in water (agar-based dip-slides, ATP, etc.). Include a Legionella testing every 30 days of operation. There are numerous water consultants to assist you. They will develop a plan that reflects your buildings water systems. ASHRAE standard 188: The American Society of Heating, Refrigerating and Air-Conditioning Engineers has released a comprehensive standard regarding Legionellosis risk management. Rapidly installed and compatible with building HVAC systems. In use now for over 6 years, the OzonairTM has provided real estate owners and managers enhanced indoor air quality and a solution for the remediation of recurring indoor air quality issues. Effective, sustainable and economic, the OzonairTM has also proven its worth in odor abatement in garbage rooms and sump rooms. Contact us today to help solve your air quality issues. (Quebec) Plaza Laval, a commercial shopping mall in Quebec City had important odor issues with their trash compactor. Indeed, as the majority of shopping centers, all wastes are dumped in one location. Not only was the garbage smell unbearable, the heat and humidity during the summer months worsen the situation. For several years, the mall was using a deodorizing liquid. This type of liquid is expensive and dosages needed to be periodically adjusted during the season. In certain occasions, the injection of the product was not enough to mask the smell. To resolve the situation, EMO3 installed their proprietary OzonairTM to inject ozone directly into the trash compactor. Not only it’s more environmentally friendly, but it’s also more effective. Ozone is a great way to neutralize odors in all type of situations. With this installation, Plaza Laval was able to reduce the monetary cost by more than 38% and the use of ozone proves to be more effective. 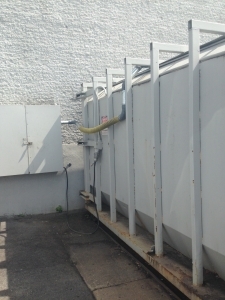 In addition, managers have less management to do with their trash compactor, since they don’t have to constantly check the amount of liquid deodorant..
Our main tenant was seeking to improve the indoor air quality for the well-being of their employees. Various complaints related to odors, eye irritation, cough and even asthma were observed. Following a trial period on a designated floor and the characterization of the air quality, consisting of a series of indicative parameters such as thermal comfort, volatile chemical contaminants, particle count and mold count were compiled. This air quality characterization was conducted by a 3rd party engineering firm. Following the trial period, we quickly noticed an important improvement in air quality, notably a reduction in occupant discomfort and a reduction in asthma attacks for thus vunerable to this. In addition, these improvements were confirmed by the 3rd party engineering report which confirmed an 80% reduction in fine particle count (0.3 micron to 0.5 micron) as well as an 85% reduction in mold count from 93-370 colonies per m3 to 21-50 colonies per m3. Having no mecanical method for dosing our biocide chemicals, we were seeking an alternative that would provide an enhancement towards workplace health & safety, while be effective against Legionnella virus, be economical and ecological (green). We found the solution in the Insitu-O3 from EMO3. Not only did we improvement our operation performance, we also automated the process allowing us to allocate our maintenance ressources to other tasks. In summary, we offered ourselves a peace of mind solution. Our client Neomed, a major company in Research and Scientific Development, was struggling with sewage smells in their establishment including, hydrogen sulfite that emanated from the pump room of the sanitary pit. These smells were spreading in the corridors, offices and also in the elevator column creating complaints among employees. Having few options, Neomed appealed to EMO3 to help neutralize these odors. Following a meeting, EMO3 quickly deployed OzonairTM near the pump room to neutralize these odors. Due to the presence of periodically workers in the pump room, EMO3 installed permanently an ozone sensor connected to a controller to meet Canadian ozone standards. This controller allows basing the operation of the OzonairMC on predetermined values. All employees who have worked in the pump room during treatment were guaranteed to be in contact with an amount of ozone substandard. Results: The solution EMO3 eliminated odor complaints from the Neomed staff and allowed odor neutralization of more than 85%.